Code Developed in the Lab of Dr. Murat Torlak at University of Texas at Dallas, and ported to LabVIEW Communications 1.0 by National Instruments. The application decodes and displays 802.11b network SSIDs generated by an ad-hoc network from your computer's wireless adapter. 4. Process: The SSID decoding is done in the Decode SSID.gvi in this state of the state machine. Decode SSID.gvi performs a frequency offset correction and then demodulates and de-scrambles the data according to the spec. An ASCII look-up table then translates the bits into characters. Some logic is then executed to ensure the data is valid before logging it into an array and displaying it on the front panel. Troubleshooting: Occasionally there may be characters that are not recognized properly. Performing some equalization and adding a few other tuning parameters should minimize their occurence. In Windows: open the "Network and Sharing Center"
for my computer, 0 = b and 1 = g Ad Hoc network. I set it to 0. Double click this network and you're live! Hovering over the ad-hoc network will tell you the status - it is transmitting if it displays 'Waiting for Users', see figure 2. 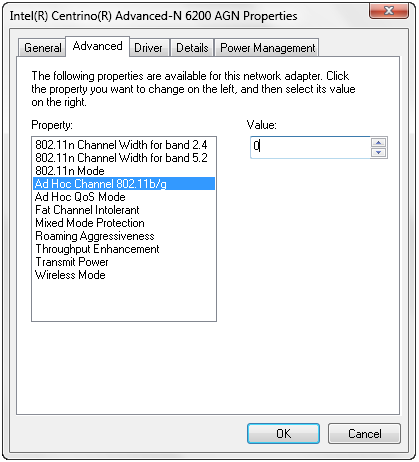 Ensure you are using Ethernet adapter drivers from the manufacturer of your Ethernet adapter. Native Windows drivers do not always offer the best performance nor the flexibility to adjust advanced settings. Try increasing the Tx and Rx buffers in your Ethernet adapter settings. This will typically be found in Windows Device manager: right-click >> properties of your Ethernet adapter (the one connected to your USRP) >> Advanced Settings >> Performance Options >> Tx Buffer/Rx Buffer. Once you've increased the values (1024 or 2048 are good settings to try), reboot your system. LabVIEW 2014 version of this example is available here. Click Here to discuss this and other examples on the LabVIEW Communications Discussion Forums. I tried to open the project in LabVIEW NXG 2.1, but the Decode SSID.gvi is throwing an error "Load Error: An error occurred while trying to load "Decode SSID.gvi". The source file format is invalid." Is it due to the NXG version or am I missing something. It would be great if you could help me out.